There were 480,000 views of the 102 videos on the You Gotta Be Here YouTube channel. The Paralympic spirit ignited in Esquimalt and the Victoria Harbour on Day 4 of the Paralympic Torch Relay in British Columbia, March 6, 2010. Video from our YOU GOTTA BE HERE street reporter. Enthusiasm and fun are both on the rise in Vancouver during the final countdown to the Opening Ceremony of the Olympic Winter Games. Olympic Torch Relay in Vancouver, B.C. A fashionable 210 Olympic Games. Fashions for the medal bearers and medal box were designed by Aritzia, represented here by Sara and the Aritzia Yeti. Olympic Large Business in Vancouver, B.C. 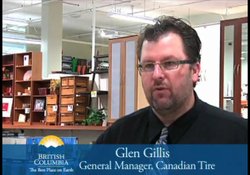 Customers and General Manager, Glen Gillis of Canadian Tire talk about the Olympic Games, the new Canada Line, and what it has delivered for business in Vancouver. Olympics 2012: Torch Arrives to New Westminister, B.C. One great community. Loads to see and do in New Westminster during the 2010 Olympic Winter Games.